A sheet of common blotter paper is placed on a flat surface and a dipstick is used to place a few drops of oil in the middle of the sheet and left for an hour. 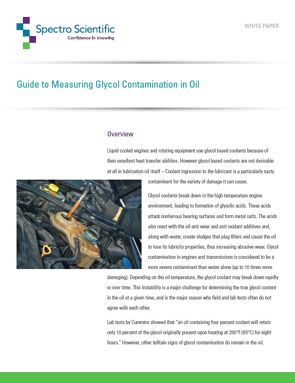 Perhaps the best known quick test for glycol is the Schiff’s reagent method (ASTM D2982). Infrared Spectroscopy is commonly used in the lab or in the field to detect a series of molecular contaminants and lubricant chemistry degradation parameters. Infrared spectroscopy uses an Infrared radiation source, a sample holder, a detector, and a computer to study the interaction of matter and light. Elemental analysis by Inductively Coupled Plasma (ICP) emission spectroscopy or by arc-spark Rotating Disc Electrode (RDE) emission spectroscopy has been standard practice for oil analysis testing labs for years, as detailed in ASTM D5185 and ASTM D6595.